Hello, YABC readers! 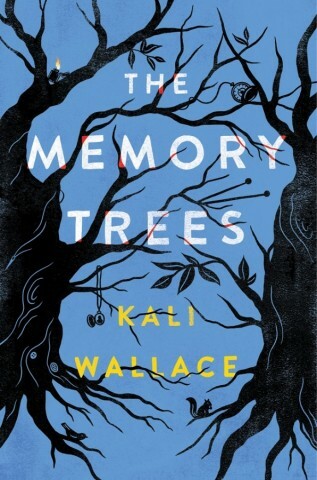 I am so happy to have a chance to share the lovely cover of The Memory Trees with you. This is a book about mothers and daughters, families and feuding, and dark secrets from long ago, all set in an apple orchard in the mountains of Vermont. I'm not the most visually-inclined person, so the only ideas I had for the artist and designer were along the lines of, "IDK, maybe some trees? Like, real trees? Or family trees? Trees?" Luckily, they didn't need my help. Artist Connie Gabbert and designer Heather Daugherty put together a cover that is so beautiful I've been sneaking looks at it for weeks to reassure myself that it's real. I love that it's a little bit spooky (the sly hints of red! the bare branches! the flame! ), a little bit old-fashioned in a classy kind of way, and an absolutely perfect match to the story and atmosphere of the book. I couldn't be happier with how it turned out. Sorrow Lovegood's life has been shaped by the stories of her ancestors: brave, resilient women who have lived for generations on a capricious apple orchard in Vermont. Sorrow and her family take pride in their land and its strange history. Their offbeat way of living may be ridiculed by the townspeople--especially their neighbors, the Abrams family--but for the first eight years of her life, the orchard is Sorrow's whole world. Then one winter night everything changes. Sorrow's sister Patience is tragically killed. Their mother suffers a mental breakdown. Sorrow is sent to live with her father in Miami, away from the only home she’s ever known. Now sixteen, Sorrow's memories of her life in Vermont are maddeningly hazy; even the details of her sister's death are unclear. She returns to the orchard for the summer, determined to learn more about her troubled childhood and the family she left eight years ago. Why has her mother kept her distance over the years? What actually happened the night Patience died? Is the orchard trying to tell her something, or is she just imagining things? The Memory Trees is a darkly magical novel about a mysterious family legacy, the bonds of sisterhood, and the strange and powerful ways we are shaped by the places we call home. Kali Wallace studied geology and geophysics before she realized she enjoyed inventing imaginary worlds more than she liked researching the real one. Her short fiction has appeared in Clarkesworld, F&SF, Asimov's, and Tor.com. After spending most of her life in Colorado, she now lives in southern California. Her first novel, Shallow Graves, was published by HarperCollins in 2016. Three winners will each receive a signed hardcover copy of Kali Wallace's first novel, SHALLOW GRAVES, which the option to be personalized. The cover is very simple and direct, and I very much enjoyed the synopsis! Not a fan of the cover but I love the synopsis. Seems like a good book to read! I love when there are family secrets because it makes for a great drama and mystery. The cover is okay but I think I like the story a lot more. The cover is pretty but also creepy which sounds like it fits the story perfectly! I'm really intrigued by the synopsis and can't wait to read it! The cover isn't my favorite ever, but it's nice. The synopsis is really interesting. It sounds very mysterious, and I like the orchard setting. Love this cover so much! Can't wait to read the book. This book sounds amazing, and that cover is gorgeous! More than just the cover, I really like the title. It sounds like a fascinating, deep story that already drew me in. I absolutely love the cover. The haunting trees, the items hidden throughout, the mystery.. Its beautiful. The story sounds very intriguing!